If you are participating in the Lucky Rewards program, you may want to plan your next big shopping trip for Thursday March 31 in 2016, because on that day, according to the email sent to program members, you will earn 3X rewards points instead of the usual 1X. 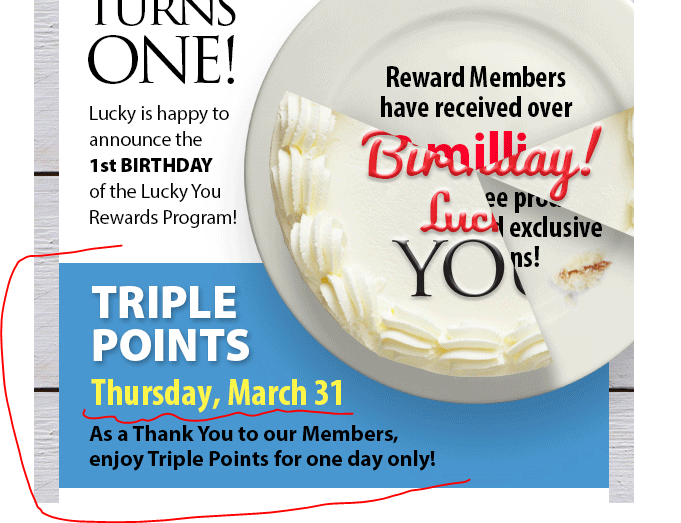 No coupon is needed, the points will be tripled automatically on that day by their computers. If you are not familiar with the Lucky’s Rewards program, here is out introduction to it. Chromebooks have certainly come a long way since the early days when Samsung’s goofy model (with the ports on the back) became the first “blockbuster” Chromebook, topping the best selling charts at Amazon for a long time. Since then, many and more models and manufacturers jumped right in, trying all kinds of different things to differentiate themselves. Which brings us to today, Acer has a new semi-luxury 14-inch Chromebook, the awkwardly named CB3-431-C5XK, with an aluminum chassis, a 1080p display and 4GB of RAM (the web is getting more and more bloated, my 2GB Chromebook sometimes has a hard time keeping up with some of the bloated big media websites). It has 32GB on-board storage, and loves to eat celery (aka a Celeron processor, the N3060 which is apparently new enough that is not listed yet at cpubenchmark.net). It also has two USB 3.1 ports and the latest Bluetooth (4.2 or so). However, some compromises had to be made: no touchscreen! It is now available for pre-order for $300 at Amazon.com (no date provided yet). UPDATE (April 12, 2016) Since the original post, Starz launched their own standalone subscription option and updated their apps. The promotion mentioned below is no longer available. You can still start a 7-day free trial (directly from the Starz apps or thru Prime) and if you don’t like it, you can cancel. It is a month-to-month subscription (like Netflix). Note that if you sign up through Prime, you don’t get a Starz account, you have to watch through Amazon’s own video apps (Instant Video, Web Browser, etc) and channels (Roku, FireTV, etc). I believe some cable companies are having a weekend binge promotion that includes Starz (I think Comcast Xfinity) but I don’t know if that’s open to all or only their own customers or even further restricted to their TV subscribers. If you have an American Express credit card with Membership Points (not the Blue line of cards), they have a new promotion running under the “AMEX Offers” section that went live on March 22 in 2016. You earn 2X membership points on Amazon.com purchases made with the card. The promotion is good until 7/31/16. You must manually opt-in to this promotion. Even though it expires in four months, the window to opt-in is typically small. In other words, if you don’t opt-in, the offer won’t be shown in your account for four months. In other words, if you think you may use it, add it to your card the next time you login to your account! 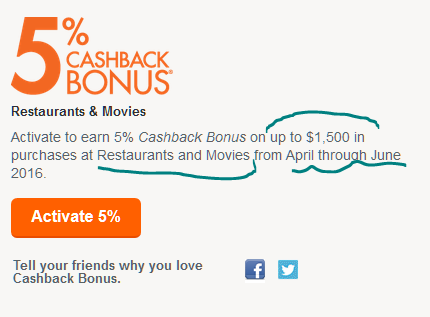 The second quarter of 2016 is a good 5% cashback season. Chase offers 5% on Grocery Stores and Warehouse Clubs, and Discover is diversifying into two more popular categories, restaurants and movies! 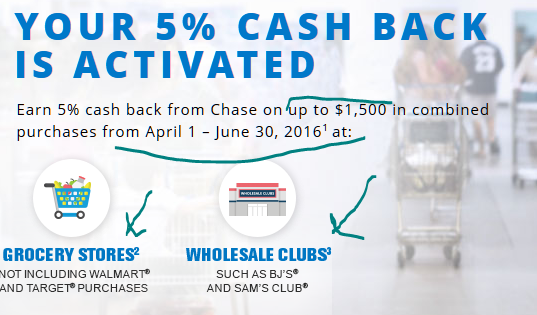 The second quarter of 2016 (April 1st until June 30) is a very quarter to be a Chase Freedom credit card holder. Their 5% Cashback Promotion is Grocery Stores and Wholesale Clubs. The usual limit of $1500 per credit card applies. If you spend more than $1500 in these two categories per individual card, you will earn the usual 1% for amounts over $1500. You still get 5% for the first $1500 per card. 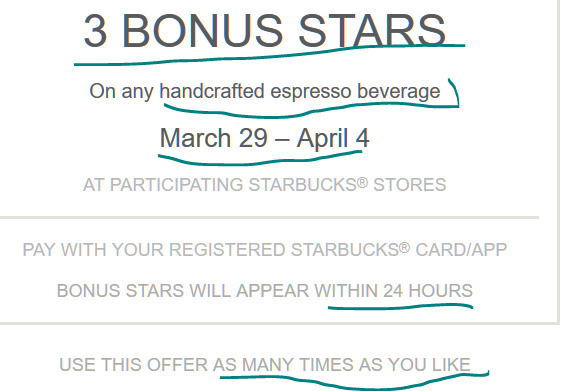 Still before the April 12 switchover, this new promotion for Starbucks Rewards members gets you 3 Bonus Rewards (in addition to the standard one star per purchase) on any hand-crafted espresso beverage you purchase between March 29 and April 4 in 2016. Per the terms, you can use this offer as many times as you like. There is no coupon code to enter, it will happen automatically. Strategically, as we get closer to April 12, you may want to get to 12-stars before April 12, especially if you are planning to cut back on your Starbucks after the new program comes into play. While previously earned Stars will convert at a fair rate (11 new stars for every 1 one star), you have to spend more to complete a reward (125 stars = $62.50 total). This promotion ended but Starbucks keep launching new rewards promotions. You may want to max out on these, because starting April 12 they are switching to the new Rewards program that favors big spenders. To get the same level of benefits with the new program, you have to spend an average of $5 per purchase! The new (horrible for many existing customers) Starbucks Rewards program now has an official start rate, it is going to be April 12 in 2016 according to an email sent to their members. If you have any existing actual Rewards, they will transfer over straight-up. If you have any pending stars, they will be multiplied by 11 and then transfer over to the new system that is favoring big spenders. You can read more about it at my previous post (linked in the first paragraph) but to summarize, if you spend an average of $5+ per order, you will benefit more from the new reward program. If you average less than $5, then you will get fewer rewards. The previously mentioned sales ended, but they are a bit cyclical, the prices will drop again at some point in the future (I obviously don’t know when)….